When a jigsaw does not cut it, the scroll saw will be there to save the day. Like a scroll saw, we aim to help you cut curves in finding the scroll saw that will function best in your workplace. On this site, you can read our industry professional scroll saw reviews as well as those left by users like you. 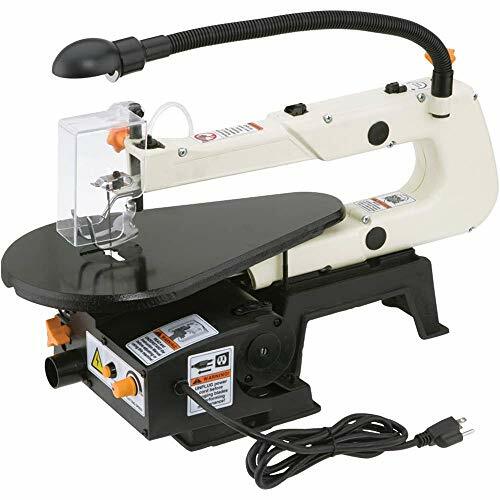 If you have sawed with a certain type of scroll saw, you are able to leave your own scroll saw reviews in our reviews section. Scroll saws are designed to make specialized curved cuts that are too difficult or intricate for a coping saw or jigsaw. However, our scroll saw reviews have found that scroll saws are very similar to jigsaws because they use a blade that continuously reciprocates. We give high scroll saw ratings to any scroll saw that allows you to easily change blades, as they will need to be changed frequently between projects. 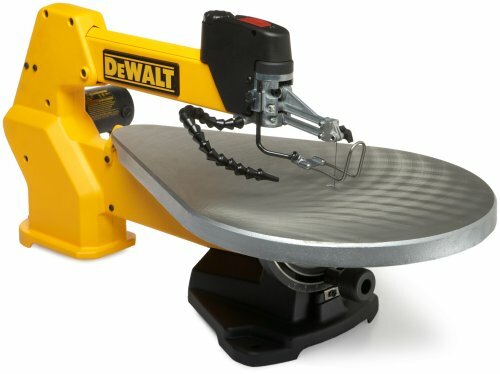 What to Look For in a Scroll Saw? During our scroll saw reviews we have found that there are many blade features you must consider when choosing the right one. The blades of a scroll saw are extremely thin, delicate, and come with a variety of different teeth options depending on what job you are trying to complete. Our scroll saw reviews have found that most scroll saw blades are rated in teeth per inch or TPI. The more TPI on a blade, the more accurate you will be able to cut at the price of the blade being more delicate. Depending on the scroll saw, pin-end and plain-end blades are two major types of blades accepted. A scroll saw utilizing a pin-end blade will hoist the blade up with a small hook-like pin. Our scroll saw reviews have found that pin-end blades allow for a very quick blade change. Scroll saws accepting plain-end blades are the oldest type of scroll saw blade. Plain-end blades are essentially clamped via vice-like jaws into the scroll saw. During our scroll saw reviews we have found that plain-end blades are more readily available at hardware stores than their pin-end counterparts. Some of the scroll saws in our scroll saw reviews include variable speed pedals that allow you to have complete control over the speed of the blade. 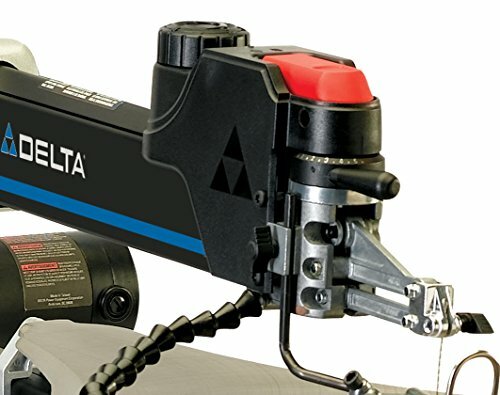 We recommend variable speed controlled scroll saws to anyone looking to make the most precise cuts. Scroll saws come in a variety of different sizes and can be used with many different blades to meet the demands of various jobs. We highly recommend that when using a scroll saw you wear a mask with good ventilation and make sure to keep fingers far away from the blade. While performing our scroll saw ratings, we have found that proper cuts are always achieved under good lighting conditions. The platform is one of the most important parts of a scroll saw. The working table that is provided with your saw should be adequate for the cutting application or the purpose for which you are going to use the saw for. Vibration is likely to occur when making a cut so assess the stability level of the platform when evaluating a scroll saw. Throat size is another key factor to consider. Throat size is the distance from the front of the blade to the back of it and the number is often described in the saw’s model number. 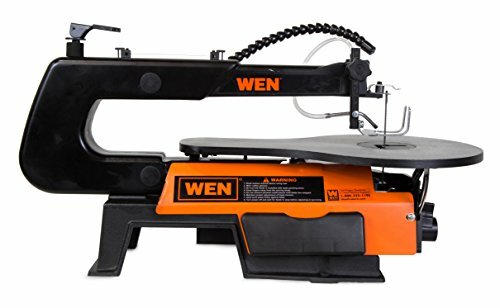 If you are going to make large cuts then you need a 22 inch scroll saw but you don’t have to pay a higher price if you need to make cuts suitable for only a 16 inch scroll saw. Skip tooth blades cut fastest but most roughly. Regular tooth blades cut slowest and double tooth blades are somewhere in between. Reverse tooth blades give a splinter free bottom cut but cause the wood to hop more. To counteract this you need to use more hold down pressure. At least 2 reverse teeth should be showing above the table on the up stroke for the reverse teeth to be effective. Proper tension will make the blade cut better and last longer. If the blade is too loose it will wander, too tight and it will break often. Relax when you cut. Don’t force the blade through the wood – allow it to do the cutting. If you force the blade it will wander off line or break. Learn to make quick crisp corners to avoid burning – which is often caused by the blade rubbing in the same place. Use lower # blades for thin stock and light corners. Use larger # blades for thicker stock. The fewer TPI the faster the blade will cut but the coarser the finish. Often not all blade types are available in all sizes. Teeth regularly spaced along the blade. Slowest cutting but smoothest cut. Best control blade. Good for intricate scroll work. An ordinary skip tooth blade, without reverse teeth. Fast cutting and less hopping. The teeth on these blades have a very positive rake. The teeth face forwards and are very aggressive so you get a smooth cu with a fast cutting rate but they are not so easy to control. Experienced hand required. Cuts in any direction but not so smooth. Good for cutting large projects in material like slabs or burls. Blade for cutting brass, copper, aluminum, coins etc. Not iron or steel. A skip tooth, reverse tooth blade. Ground teeth are very sharp and stay sharp longer. Less prone to burning. Splinter free top and bottom cut. Excellent control and long lasting blade. Splinter free top and bottom cut. Some hopping. Same as DT/R but without the hopping. Good control blade. Every third tooth is reversed. A good blade for intricate cutting. Good control with very smooth top and bottom cut. To small a blade will mean more breakages. If you try to cut to fast you will wander off line. To tight a blade will cause breakages. To loose will cause wandering. Type of material will always effect the above sizes. Ask other scrollers which blades they prefer for different materials. Scrollers are almost always willing to share information and ideas. Beginner’s tend to want to push the wood into the blade. That leads to knotted muscles in a hurry. Relax! Less pushing always makes for easier cutting. A reverse tooth blade means that the last three teeth at the bottom of the blade are going in the opposite direction than all others. This change in direction helps eliminate burrs on the bottom of your workpiece. Round over the back of your scroll saw blade. This will help eliminate some of the frictional heat caused by the square corners of the blade rubbing against the material you are cutting. Position a honing stone at a 45-degree angle to the back of the blade. With the blade moving, lightly touch the stone to the blade. Turn the saw off and repeat on the opposite back edge. Always wear eye protection when drilling, cutting, or sanding brass. The clear packing tape lubricates the blade, but make sure to tape over the entire cutting surface for greater stability. The edges of brass are sharp and will cut your hands; wrap all edges in tape. You can double the life of your blade by creating a higher working surface to take advantage of the blade’s unused portion. Turn corners slowly to avoid catching the brass and lifting it off the table. Be aware of the heat that is generated quickly when cutting and sanding brass. Don’t try to cut brass without the backer board. As you cut, the blade is creating burrs on the backside. This not only impedes the movement of the piece as you work, but will also scratch up your table. Make sure you check the direction of the teeth—they must be pointing down—before you start the saw. Run your thumb up the front of the blade to assure the teeth are pointed down and to the front of the saw. These small blades actually can turn 180 degrees as you tension the blade. Tension and saw speed are two critical factors that affect any blade’s use and longevity but are especially important when it comes to fine blades. Too much tension can snap the blade before you actually begin to cut! Since the blades are not as rigid as larger blades (#5, #7 and #9, for example), too little tension allows the blade to flex much more than larger blades. In terms of saw speed, I find the best success when I run the saw between 1,200 and 1,400 strokes per minute. Tension is good, as long as it’s in your blade and not in your body. But too much or too little blade tension causes blades to break frequently. Apply only enough tension to hold the blade with no more than 1ž8″ flex from side to side. When you pluck the blade like a guitar string, it should make a nice, clear ping. With heavy usage, most blades last about 30 minutes before they become dull or break. Keep an extra supply of blades close at hand while scrolling. I attach a magnetic strip to my saw stand, then place the blades on the strip. • Make yourself comfortable before starting. Try sitting down at the saw instead of standing. • Use a foot control, if possible. 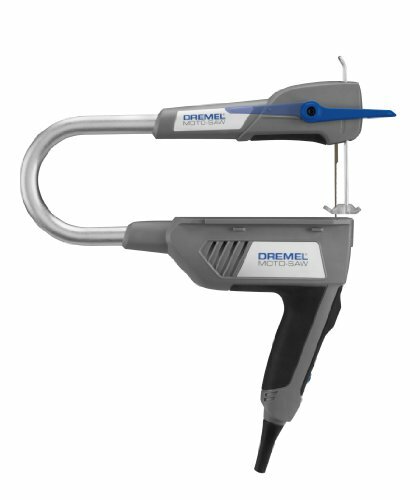 It allows you to keep both of your hands on the workpiece. • Relax and let the blade do the work. • Don’t forget your safety glasses. • Don’t be afraid of making mistakes! “Mistakes” make each piece original. Read our scroll saw reviews and take a good look at the comparison table we offer. If you need help then leave us a comment!